This event costs 0 credit to attend. To aquire credits (1$ per credit) You can either donate now and be added to guestlist by clicking "Donate", or you can secure a space on the guestlist and donate at the event by clicking "reserve". Thank you for joining the Godberd community! In 2009 I wrote a short story called “The Inevitability of Something That Once Felt Impossible” and decided it would make a good movie. I had never read a script, been on a set. At that point I didn’t even really watch movies. This did not stop me from making my feature film, Light is the Day. Is it worth sharing and talking about? OMG SO MUCH PLEASE COME SEE IT I WILL SKIP THROUGH THE BORING PARTS. 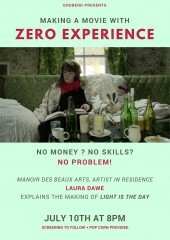 Please join us in The Library at Manoir des Beaux-Arts on July 10 at 8pm. There will be a slideshow, blushing, a movie screening, a short movie screening and popcorn. Please register to receive the address and reserve your free spot by clicking attend!